I was given this recipe from a friend who insisted that I would love it. 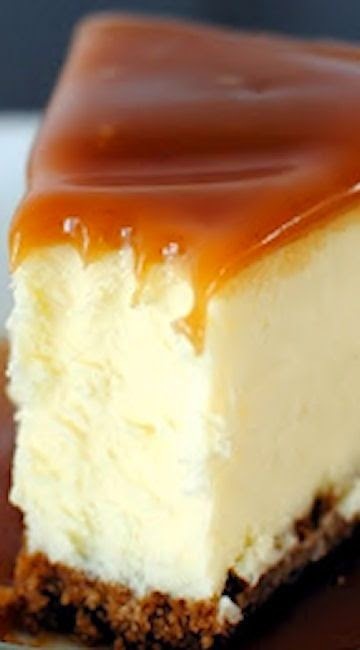 A recipe for white chocolate caramel cheesecake. She was right about me loving it, I've been itching to make it. How can one not love a cheesecake brazen enough to incorporate nearly a pound of white chocolate ganache into the batter and then slather the whole pie in caramel sauce?! She was right, I love it. So delicious with a near perfect texture. Woooo! Yea, I'm riding a serious cheesecake breakfast induced sugar high at the moment. Before I get into making the sauce, let me note that this isn't the easiest way for most home cooks to go about making caramel sauce. Melting almost pure sugar in a pan is pesky and it can burn quite easily. If you're not feeling up to attempting this part of the recipe, feel free to buy your favorite caramel sauce and warm it gently to glaze the cheesecake. In a medium sauce pan over medium high heat (I'm using non-stick for this), combine the sugar and lemon juice. Stir with a wooden spoon until the sugar is mostly melted then set aside the spoon and swirl the pan over the heat to keep the color even throughout. Continue to cook and swirl until it sugar turns a medium amber color. Watch it carefully, the sugar will quickly darken and should it become dark brown or black it will taste bitter and unpleasant. When the sauce turns the right color slowly whisk in the cream. If the caramel hardens with the addition of the cream, do not worry. Just continue to add the cream and bring the mixture back to a a boil over medium heat. Continue to stir until the sugar has remelted. Allow to boil for 5 minutes then remove from heat and stir in the butter. Pour into a heat safe container and chill until ready to use. Pre-heat the oven to 375�F. Combine the graham cracker crumbs with the melted butter and press into the bottom and 1 1/2 inches up the side of a 10 inch spring form pan. Bake for 10 minutes and then allow to cool completely on a wire rack. Reduce the heat to 325�F and prepare the cheesecake batter. Place the chopped white chocolate into a heat safe bowl and set aside. Bring the 1/2 cup of cream to a simmer over medium heat in a small sauce pan. Pour the hot cream over the white chocolate, jiggle the bowl to submerge it and allow to stand for one minute. Stir the chocolate gently until melted completely. In your mixer with the paddle attachment, beat the cream cheese until smooth and lump free. Add the sugar and mix, scraping down the sides of the bowl as needed. On medium speed, slowly add the white chocolate ganache. Once combined you can add the eggs, one at a time, beating on low speed until each egg is incorporated. Once you've added all the eggs, mix in the vanilla and salt and pour into your prepared pan. Set the pan onto a couple large sheets of aluminum foil and smooth them up the sides of the pan to waterproof. Set the cheesecake into a large roasting pan and then place in the oven. Pour the boiling water into the roasting pan, filling to about one inch (no higher than the lowest edge of aluminum foil). Allow to make at 325�F for one hour then reduce heat and bake at 300�F for an additional 60-90 minutes until the center is just set. Remove from the oven and allow to cool completely on a wire rack. Once cool chill for at least 4 hours before serving. To glaze, gently warm the 1 cup of the caramel sauce on the stove or in the microwave until slightly runny and then pour onto the cheesecake. Smooth the caramel over the cake and you're ready to serve.